What it’s about: A few weeks ago, we looked at some of history’s worst serial killers. But it can be said without hyperbole that this killer is a million times worse than all of those murderers put together. In fact, smallpox may be the deadliest single thing in human history. Through the 1800s, the disease averaged 400,000 victims a year in Europe alone. 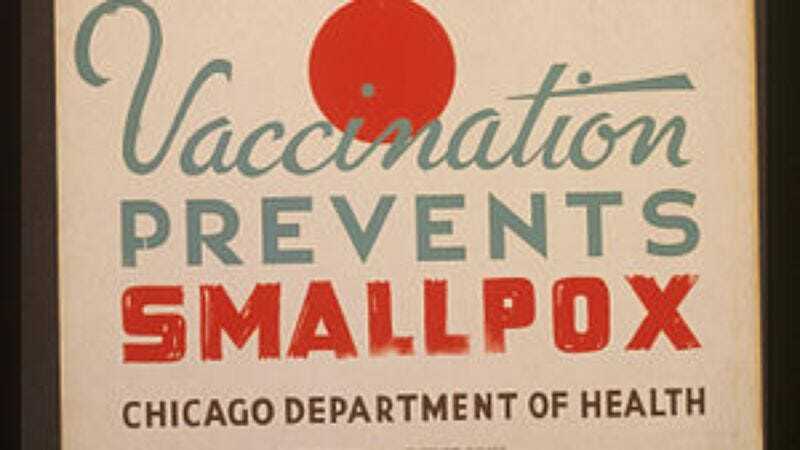 By the 1950s, there were roughly 50 million cases of smallpox a year worldwide (although the survival rate was much higher in the 20th century). And worst of all, smallpox was the main culprit in the wave of disease that swept the Americas after contact with European explorers, killing as much as 90 percent of the population on both continents. Strangest fact: Smallpox was enough of a fact of life in India that the disease was incorporated into the Hindu faith. One of the earliest recorded mentions of smallpox was from an Indian medical journal from around 400 A.D. (although the disease has been found in the tombs of the pharaohs, and is believed to have plagued humanity from as early as 10,000 B.C.). The journal described a disease marked by pustules and boils, describing: “The skin seems studded with grains of rice.” The awful nature of the disease—in which lesions appear on the mouth and throat, and spread to cover the whole body, leaving innumerable scars even if the patient survives—led sufferers to believe that smallpox was a punishment from the gods, and a Hindu goddess, Shitala, was created as the personification of the disease (and its cure, depending on whether you’re on her good side or not). Biggest controversy: One of smallpox’s most enduring entries in our collective memory is the story of blankets infected with the disease given to Native Americans in order to intentionally infect them. While this was in fact attempted—by the British Army in 1763, under siege during Pontiac’s War—it’s not clear whether the tactic was successful. In any case, smallpox didn’t need any help from blankets; the disease spread mercilessly across the Americas in the wake of Columbus and other explorers. Just as diseases evolve resistance to antibiotics, over the course of centuries Europeans evolved resistance to smallpox. Because so many Europeans were killed by smallpox, influenza, bubonic plague, and other diseases, those still alive in 1492 had relatively strong natural immunities. Native Americans, by contrast, had no exposure—and therefore no defenses—against such diseases. One reason is that Native Americans were far more hygienic. Pre-Renaissance Europeans believed bathing should only be done a few times a year, as it washed away what was thought to be a protective layer of dirt. Europeans also lived in close proximity to farm animals, and were constantly swapping diseases back and forth with livestock—causing illness, to be sure, but also building up immunities. Native Americans didn’t domesticate livestock to the same degree, and they bathed more frequently. The cities of the Inca and Aztec Empires even had working sewer systems, nearly unheard of in Europe. In one of history’s cruelest ironies, Native Americans’ healthier, more advanced lifestyle left them more susceptible to illness, and smallpox quickly ravaged North and South America. As early as 1620, the Pilgrims landed on what seemed to be a virgin continent—in fact, it was a graveyard. The site the settlers picked for the Plymouth colony was an abandoned town, Patuxet, whose few survivors had fled. The Pilgrims simply moved right in. Likewise, Francisco Pizarro was able to conquer the powerful Inca Empire with only a handful of men because smallpox had killed most of the Incan army and their Emperor, along with between 60 and 90 percent of the population. The few survivors were engaged in a bloody war of succession when Pizarro showed up, and quickly took advantage of the situation. All in all, smallpox killed an unthinkable percentage of the population in the New World—history’s greatest mass death, and one that was caused more or less by accident, as the European explorers had no intention to spread disease, and no idea how quickly they had spread it. Thing we were happiest to learn: We, as a species, have eradicated exactly one disease in history, and we picked a good one. As of 1979, smallpox no longer exists, thanks in large part to large-scale vaccinations undertaken by the World Health Organization. But the effort began centuries earlier. As early as the 10th century, Chinese doctors were using a practice known as variolation, after doctors realized two important things about smallpox: People who got it once never got it again. And if it was contracted through a break in the skin, the disease was less severe. So as a preventative measure, doctors would intentionally break the skin and rub a smallpox scab into it, so the patient would get a milder version of the disease and be spared a potentially deadly case. The process spread westward to the Ottoman Empire, and in the early 1700s, to Europe. It was another century before a doctor named Edward Jenner discovered in 1796 that people who had contracted cowpox—a much milder disease that mostly affected milkmaids—were also immune to smallpox later in life. He invented inoculation—the practice of immunizing someone to a disease by giving them something other than the disease itself. Thing we were unhappiest to learn: No place on Earth was safe from smallpox. The relative isolation of Australia provided a natural defense from smallpox for centuries, but that all changed in 1789, when an outbreak killed as much as half the population on Australia’s East Coast. To this day debate rages as to whether the disease was brought over by the British, who set up their first Australian penal colony around that time, or by sailors from Makassar, now part of Indonesia. Whatever the source, outbreaks continued throughout the 19th century. New Zealand was luckier, as the country wisely quarantined ships with smallpox on board, and only had one major outbreak. Also noteworthy: It’s a small thing, but a stunning fact: In the 18th century, every seventh person born in Russia died of smallpox. Best link to elsewhere on Wikipedia: Many early plagues from history are believed to have been smallpox before the disease had a name. The Plague Of Athens during the Peloponnesian Wars, and the Antonine Plague, which lasted 15 years and nearly destroyed the Roman Empire, are both thought to be smallpox based on historical accounts. The first recorded case of the disease in Africa is believed to be a plague that affected troops in the Year Of The Elephant, an event including elephant-mounted Ethiopian troops holding Mecca under siege. Islamic tradition holds that the invading army intended to destroy the holy city, but the elephants refused to enter. The year of the siege—probably 570—is believed to be the birth year of the Prophet Muhammad. Further down the wormhole: While New Zealand’s lone smallpox outbreak in 1913 didn’t have the devastating effect it did in some parts of the world, the same strain nearly wiped out the Rapa Nui—the native inhabitants of Easter Island. While popular lore holds that a mysterious people built the islands famous stone heads and then vanished, in fact the Rapa Nui still inhabit the island to this day. We’ll see what Wikipedia has to say about them and their island—the most remote inhabited spot on Earth—next week.